[We have the following announcement.] Harvard Law School invites applications for the Berger-Howe Fellowship for the academic year 2017-2018. Eligible applicants include those who have a first law degree, who have completed the required coursework for a doctorate, or who have recently been awarded a doctoral degree. A J.D. is preferred, but not required. We will also consider applicants who are beginning a teaching career in either law or history. The purpose of the fellowship is to enable the fellow to complete a major piece of writing in the field of legal history, broadly defined. There are no limitations as to geographical area or time period. Applicants for the fellowship for 2017-2018 should submit their applications and supporting materials electronically to Professor Bruce H. Mann (mann@law.harvard.edu). Applications should outline briefly the fellow’s proposed project (no more than five typewritten pages) and include a writing sample and a curriculum vitae that gives the applicant’s educational background, publications, works in progress, and other relevant experience, accompanied by official transcripts of all academic work done in college and at the graduate level. The applicant should arrange for two academic references to be submitted electronically. The transcripts may be sent by regular mail to Professor Mann at Harvard Law School, Cambridge, Massachusetts 02138. The deadline for applications is February 15, 2017, and announcement of the award will be made by March 15, 2017. The fellow selected will be awarded a stipend of $38,000. Law and democracy are typically seen as interdependent: laws protect the fundamental rights that make democracy possible, while democracy ensures the legitimacy of law-making bodies. However, the two principles conflict just as often as they complement one another. Where democracy calls for radical change at times, the law looks to precedent and tradition. Where democracy privileges majority opinion, constitutional law often prioritizes minority rights. Where democracy depends on vocal dissent, and even civil disobedience, courts and law enforcement officials typically aim to contain civic unrest. Law and democracy are central pillars of the modern nation-state, but the conflicts between them–at polling stations or protests, in courts or legislative chambers–betray fundamental tensions in political and social life. The Brown Legal Studies initiative invites paper submissions on the subject of “Law and Democracy” for its second annual graduate student conference. At a moment when important political and legal institutions in the United States are challenged from within and without, our conference will consider the interaction of law and democracy, both in our own time and in broader historical or comparatist contexts. We hope to foster interdisciplinary conversation and so encourage papers from any discipline, including (but not limited to): Jurisprudence, History, Ethnic Studies, Philosophy, Anthropology, Literature, Classics, Political Science, and Sociology. We welcome abstracts addressing any geographical area or historical period. Possible topics of discussion may include consent, political legitimacy; human rights, civil liberties; protest, civil disobedience; white supremacy, racisms; class, nepotism; voting, disenfranchisement; war, imperialism, neo-imperialism; expertise, bureaucracy, technocracy; mediating institutions such as legislatures, town halls, electoral college, party system; environment, natural resources, stewardship; corporations, lobbying, anonymity; litigation, judicial discretion; corruption, ethics, accountability; public reason, debate, truth, epistocracy; education, civic knowledge, literacy; consumerism, boycotts, divestment; religion, pluralism. Please submit a 250-500 word abstract, along with a copy of your C.V, by Monday January 16th, 2017. Submissions should be sent to brownlegalstudies@gmail.com . If you have questions, please contact Jonathan Lande ( jonathan_lande@brown.edu ), Katie Fitzpatrick (kathleen_fitzpatrick@brown.edu ), or Sara Ludin ( saraludin@berkeley.edu ). More information is also available [here]. This essay deals with the various perspectives and interpretations of the Treaty of Waitangi over time. Drawn from a multi-author collection of essays in memory of the scholarship of the historian Ian Wards, the author argues that, whilst we must be mindful of not producing ‘treaty-centric’ histories, it is important not to reduce the historical interpretative complexities of the Treaty. Hickford continues by stating that one must be cautious when assuming the framers’ original intent deserves priority attention in interpretation. Instead we must look more deeply into the texts to embrace the nuances, complexities and frailties within them, including the ways in which they instantiated a number of interpretative communities. It is concluded that whilst the texts lived many lives of interpretation, argument and negotiation, their significance lies in their strength as texts, allowing them to become a lasting focus for political relations, and the development of constitutional histories (even as these material realities of indigenous and colonial co-existence were concealed or masked). The American Society for Legal History announces the Peter Gonville Stein Book Award, to be presented annually for the best book in legal history written in English. This award is designed to recognize and encourage the further growth of fine work in legal history that focuses on all non-US regions, as well as global and international history. To be eligible, a book must sit outside of the field of US legal history and be published during the previous two calendar years. Announced at the annual meeting of the ASLH, this honor includes a citation on the contributions of the work to the broader field of legal history. A book may only be considered for the Stein Award, the Reid Award, or the Cromwell Book Prize. It may not be nominated for more than one of these three prizes. The Stein Award is named in memory of Peter Gonville Stein, BA, LLB (Cantab); PhD (Aberdeen); QC; FBA; Honorary Fellow, ASLH, and eminent scholar of Roman law at the University of Cambridge, and made possible by a generous contribution from an anonymous donor. For the 2017 prize, the Stein Award Committee will accept nominations of any book that bears a copyright date of 2015 or 2016 as it appears on the printed version of the book. Please contact the committee chair, Mitra Sharafi, with any questions:mitra.sharafi@wisc.edu. The announcement on the ASLH website is available here. The Baldy Center for Law & Social Policy at the State University of New York at Buffalo plans to award several fellowships for 2017-18 to scholars pursuing important topics in law, legal institutions, and social policy. Applications are invited from junior and senior scholars from law, the humanities, and the social sciences. Post-Doctoral Fellowships are available to individuals who have completed the PhD or JD but have not yet begun a tenure track appointment. Post-Doctoral Fellows will receive a stipend of $40,000 and may apply for up to $2000 in professional travel support. Post-doctoral Fellowships will ordinarily be for a period of two years. (5) if a mid-career or senior applicant, the time period during which the applicant would work at the Center. Completed applications are due no later than January 17, 2017. (Apply by clicking the button below). For further information, see our answers to frequently asked questions. Additional questions about the Baldy Fellows Program should be addressed to Gloria Paveljack, gep@buffalo.edu or (716) 645-2102. There are a number of engaging and timely reviews out this week. In The Atlantic is a review essay featuring Jane Kamensky's A Revolution in Color: The World of John Singleton Copley and Alan Taylor's American Revolutions: A Continental History, 1750-1804. The is a host of relevant reviews in this week's New York Times. David Oshinsky's Bellevue: Three Centuries of Medicine and Mayhem at America's Most Storied Hospital receives a review. The paper also carries a review of Glen Jeansonne's Herbert Hoover: A Life. Peter Fritzsche's An Iron Wind: Europe Under Hitler is also reviewed. Finally, a review essay considers The Black Panthers: Portraits from an Unfinished Revolution edited by Bryan Shih and Yohuru Williams and Black Power 50 edited by Sylviane A. Diouf and Komozi Woodard. David Oshinsky reviews Steve Hahn's A Nation Without Borders: The United States and Its World in an Age of Civil Wars, 1830-1910 in The Washington Post. The New York Review of Books has a review essay that engages The Other Slavery: The Uncovered Story of Indian Enslavement in America by Andrés Reséndez and An American Genocide: The United States and the California Indian Catastrophe, 1846–1873 by Benjamin Madley. The Los Angeles Times carries a review of Heather Hendershot's Open to Debate: How William F. Buckley Put Liberal America on the Firing Line. At H-Net is a review of Meg Jacob's Panic at the Pump: The Energy Crisis and the Transformation of American Politics in the 1970s. Also reviewed at H-Net is Andrew Arnold's Fueling the Gilded Age: Railroads, Miners, and Disorder in Pennsylvania Coal Country. 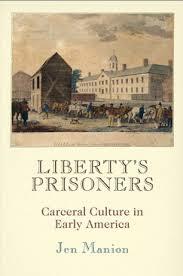 In Common-Place is a review of Jen Manion's Liberty’s Prisoners: Carceral Culture in Early America. At the New Books Network James Alexander Dun is interviewed about his Dangerous Neighbors: Making the Haitian Revolution in Early America. Also at the site Coll Thrush speaks about his Indigenous London: Native Travelers at the Heart of Empire. Leon Wildes is interviewed about John Lennon vs. The U.S.A.: The Inside Story of the Most Bitterly Contested and Influential Deportation Case in United States History. Finally, Vicki Lens is interviewed about her Poor Justice: How the Poor Fare in the Courts. Indelible Ink: The Trials of John Peter Zenger and the Birth of America’s Free Press by Richard Kluger is reviewed in the Washington Independent Review of Books. In the Los Angeles Review is a timely review of Nicholas O'Shaughnessy's Selling Hitler: Propaganda and the Nazi Brand. Also reviewed at the site is Douglas Smith's Rasputin: Faith, Power, and the Twilight of the Romanovs. On November 27, 2006, at a kitchen table in Sharon, Massachusetts, the Legal History Blog was born. The first post was a simple hello, announcing the blog to come. The next posts appeared with the sort of fare LHB readers have come to expect: posts about new SSRN papers, a call for papers, news about a new book and an honor bestowed on legal historian Morty Horwitz. The very first person to comment on the blog was legal historian Al Brophy, who is also a blogger. Readership began with a handful of visitors, and then built steadily as more of you came along. In honor of LHB’s 10th anniversary, I thought I would tell you the story of LHB’s early days when I created the blog at my kitchen table. It is a story about how social media can enhance a field, and it is also a personal story about the way the blog mattered to my life as a scholar. I began the Legal History Blog on my own after a couple of legal historians I’d asked to join me were too busy. Going it alone was a little terrifying, but had some advantages. I could give the blog the sort of tone and content that I thought it needed, and I hoped this would help LHB establish a readership. One important model for the blog was Lawrence Solum’s Legal Theory Blog devoted solely to posts about scholarship. Another model was History News Network and similar sites with news of the field and occasional opinion pieces. This sort of blogging was sustainable because it didn’t rely on a steady stream of original essays. LHB was warmly welcomed into the law and history blogospheres. But sometimes fellow legal historians seemed surprised that I would devote time to blogging and wondered why on earth I did it. I started the blog because I felt that the field of legal history needed a more dynamic online presence. Scholars in other fields often had an outdated and narrow understanding of what legal historians did. I wanted to show that we weren’t antiquarians of formal law, and to illustrate the ways legal historians draw upon all the rich methodologies employed by others. Legal historians have long focused on social and intellectual history. I wanted to create a space that also emphasized transnational and comparative legal history and the sort of work that now falls within the field of the United States and the World. I hoped the blog would help scholars connect with each other and would bring new readers for the works posted about. Although I created the blog because I thought legal history needed it, LHB also turned out to be very good for me. I was on leave in the fall of 2006 with a fellowship from the American Council on Learned Societies to complete my book on Thurgood Marshall’s work in Africa. I found a creative way to “top off” that fellowship: my daughter and I moved in with my then-boyfriend (hence the blog’s Sharon, MA birthplace). We all long for those stretches of time for writing that come only with a leave, and the isolation of Sharon – way out in the Boston suburbs – helped me protect my writing time. But writing is not always exhilarating. Sometimes I would get to the end of the day with little more than a paragraph – and then I would delete it. On days when the writing made me feel worthless, the blog was something of a savior. There were visitors! People from around the country and the world were reading my posts. Social media can be a distraction, but especially in the blog’s first year, LHB was sustenance. It made me feel connected to a broader world of readers. That audience kept me going. Ten years ago today, Mary Dudziak sat down at a kitchen table and typed the first entry on Legal History Blog: “ Welcome! This is a new blog on news and scholarship in legal history. Stay tuned for more... “ 9,164 posts and 4.27 million page views later, we’re still here! Ponsa on Munshi, “'You Will See My Family Became So American': Toward a Minor Comparativism"
LaChance, "Executing Freedom: The Cultural Life of Capital Punishment in the United States"
In the mid-1990s, as public trust in big government was near an all-time low, 80% of Americans told Gallup that they supported the death penalty. Why did people who didn’t trust government to regulate the economy or provide daily services nonetheless believe that it should have the power to put its citizens to death? That question is at the heart of Executing Freedom, a powerful, wide-ranging examination of the place of the death penalty in American culture and how it has changed over the years. 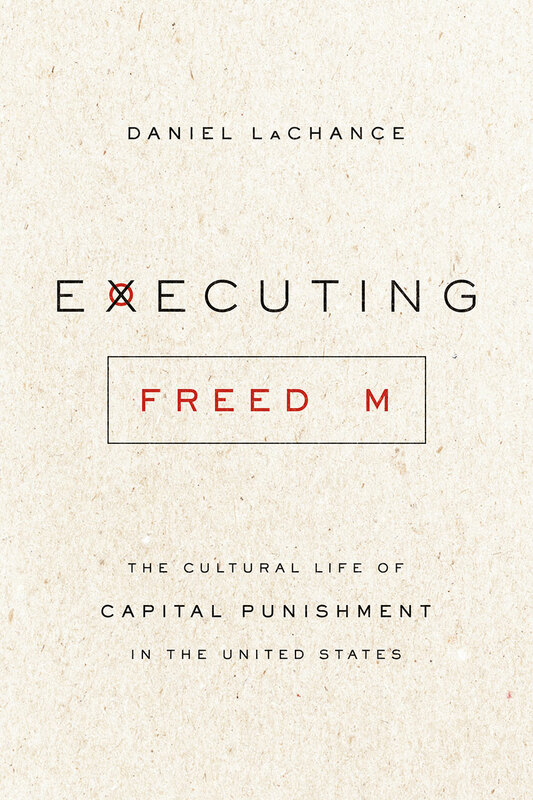 Drawing on an array of sources, including congressional hearings and campaign speeches, true crime classics like In Cold Blood, and films like Dead Man Walking, Daniel LaChance shows how attitudes toward the death penalty have reflected broader shifts in Americans’ thinking about the relationship between the individual and the state. Emerging from the height of 1970s disillusion, the simplicity and moral power of the death penalty became a potent symbol for many Americans of what government could do—and LaChance argues, fascinatingly, that it’s the very failure of capital punishment to live up to that mythology that could prove its eventual undoing in the United States. 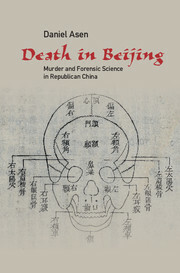 Out since August with Cambridge University Press is Death in Beijing: Murder and Forensic Science in Republican China by Daniel Asen, Rutgers Newark. Belt on Blumenthal, "Law and the Modern Mind"
Every law student worth her salt has read, or at least heard of, Oliver Wendell Holmes and The Common Law.1 His formulation of the reasonable man (or, as we call it now, reasonable person) standard structures the foundation of the law school curriculum. Susanna Blumenthal’s Law and the Modern Mind sheds light on a curious figure lurking behind that reasonable man – the “default legal person,” a phrase of Blumenthal’s creation. The default legal person standard, the determination whether people were mentally competent and thus legally responsible, “stood at the borderline of legal capacity, identifying those who were properly exempted from the rules of law that were applicable to everyone else.” (P. 12.) This quirky character “effectively delimited the universe of capable individuals who could be made subject to the prescriptive authority of the reasonable man…. [He] was supposed to remain at the margins of the common law, standing for the presumption of sanity that, jurists expected, would be warranted in most cases.” (Id.) On the one side lay rationality and legal responsibility; on the other, madness and legal exoneration. It was up to jurists, with the aid of mental health doctors, to discern the difference between the two, and therein lies the project of Blumenthal’s book. Applicants eligible for the Malkiel Scholars Award will be assistant professors in tenure-track appointments who are pursuing tenure. They will have successfully passed the standard third-year review or their institution’s equivalent no later than January 29, 2017 and will be in the fourth or fifth year of the tenure-track appointment. Applicants who would be considered for tenure during the award year will be ineligible. Malkiel Scholars may be working in any field of the humanities or social sciences. Preference will be given to those whose work echoes and elaborates themes addressed in Dr. Malkiel’s scholarship and career—that is, topics related to 20th- and 21st-century American history, politics, culture, and society, with emphases including but not limited to African American issues, women’s issues, and/or higher education. Examples might include changing perspectives on civil rights; legal, social, and organizational responses to social change (such as affirmative action or community organizing); women in leadership; single-gender higher education; the history of coeducation in higher education; and the evolution of social institutions and movements from 1900 to the present. The Malkiel Scholars Award will recognize junior faculty candidates who not only balance research, teaching, and service but in fact give great weight to the creation of an inclusive campus community for underrepresented students and scholars. The selectors will focus on and privilege service and leadership activities that address and ameliorate underrepresentation on campus, and give preference to candidates who embody a high standard of excellence. The deadline for applications is December 15. More information is available here. We have word of the conference Professionalism and Expertise Today, to be held on Friday, December 2, 2016, from 9 a.m. - 5 p.m, in the Friend Center Convocation Room, Princeton University. We understand that it is open to the public, members of which should RSVP here for lunch and a name tag by Friday, November 25, 2016. It is organized by the Center for the Study of Social Organization and co-sponsored by the Program in Law and Public Affairs. Changes in technology and culture, politics, and the economy have drastically altered the environment of work and thrown old assumptions about professionalization into doubt. Long expected to be pillars of a “knowledge” or “information” society, the professions have run into a series of developments weakening their position: losses of autonomy, shrinking markets for their services, the substitution of algorithms for individual professional expertise, popular distrust, eroding support for exclusive professional jurisdictions. Join leading scholars from sociology, economics, and law for a discussion of these and other aspects of the new world of professionalism and expertise. In a variety of areas, organizations are substituting algorithms for individual professional judgment. But what happens to legal accountability in the process? Licensing has spread in recent decades and covers an increasing proportion of jobs, while unionization has declined: What are the implications for economic inequality of these changing patterns of “occupational closure”? Economic and technological change has reshaped the demand for professional skills, and several professions such as journalism and law are feeling the impact. What are the long-term implications? This session is co-sponsored by Princeton University's Industrial Relations Section. 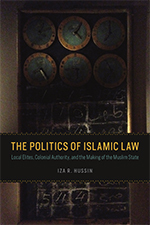 In The Politics of Islamic Law, Iza Hussin compares India, Malaya, and Egypt during the British colonial period in order to trace the making and transformation of the contemporary category of "Islamic law." She demonstrates that not only is Islamic law not the shari’ah, its present institutional forms, substantive content, symbolic vocabulary, and relationship to state and society—in short, its politics—are built upon foundations laid during the colonial encounter. 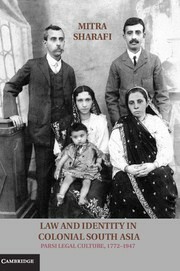 Drawing on extensive archival work in English, Arabic, and Malay—from court records to colonial and local papers to private letters and visual material—Hussin offers a view of politics in the colonial period as an iterative series of negotiations between local and colonial powers in multiple locations. She shows how this resulted in a paradox, centralizing Islamic law at the same time that it limited its reach to family and ritual matters, and produced a transformation in the Muslim state, providing the frame within which Islam is articulated today, setting the agenda for ongoing legislation and policy, and defining the limits of change. Combining a genealogy of law with a political analysis of its institutional dynamics, this book offers an up-close look at the ways in which global transformations are realized at the local level. At the intersection of social history, the sociology of law and the sociology of elites, the thesis goes back to the origin of a key concept of the French Republican State: public service. Between 1870 and 1940, this idea, which preceded the new regime, is reshaped by different types of actors in a more democratic sense, as an aggiornamento of state-thought. The legal circles (senior officials of the Conseil d'État and law professors) took a prime position during this update. They notably took advantage of the rise in importance of administrative litigation to legitimate their position as opposed to civil law specialists and impose a vision "from above" of public service, understood as true science of administration. By retracing the sequence of events that made a myth from the Blanco case of 8 February 1873, the thesis aims to give an account of the construction of a profession, that of a lawyer specializing in public law or in administrative law, at the same time as the creation of a “public” field. Actors distant from the legal field (state engineers, philanthropists, social theorists of all kinds, civil service trade unionists) gravitate to this field, struggling either not to let the State's conception of generosity to the public be imposed on them, or to get the point of view of those dominated in this field (lower and middle bureaucrats, primary school teachers) across. The enquiry therefore highlights the unequal and differentiated distribution of interest for the "public", visible in the understanding of the democratic claims of the time (the right to strike and unionize in the civil service, municipalism, the Act of Parliament on income tax), that certain actors consistently tried to translate into categories of law regarded favourably as the only right approach to the social world. Finally, in an effort to think within the contemporaries of the time’s mindset (i.e. without reading history backwards and by taking virtual history into consideration), this socio-historical work enables the understanding of the transformation of the "self-concern" of the State in a democratic age, by describing the encounter between a traditional, sovereign and masculine right hand (epitomized by the members of the Conseil d'État) and the left hand of the protective and social State. In terms of methodology and theoretical framework, the thesis is based on a prosopographical enquiry, the corpus of which is made from the different subgroups of exponents of the idea of public service between 1870 and 1940 (n = 77, the overwhelming majority are men). It alternates between an account and an analysis of the quantitative data drawn from the prosopographical enquiry, and combines archival ethnography (for the Conseil d'État), correspondence analysis and discourse analysis (administrative justice cases, jurisprudence and "theoretical" works on public service). It attempts a reasoned association between field theory and the sociology of professions. Also, as well as the career records of each individual in the prosopography, the archives that have been examined are those of the Conseil d'État, the Tribunal des conflits, law faculties (mainly Paris, Bordeaux and Toulouse), the “agrégation” examination in law and unions (federations of civil servants + CGT in its relation with the State). Before I start laying out my blogging agenda for the next month, I wanted to extend my thanks to the LHB team for the invitation. As I will discuss later, my finding a home in the legal history world was an unplanned but fortuitous turn in my career. Over the years, this blog has helped to showcase for my own consumption not only the quality but also the diversity of scholars working under the legal history rubric. Today, I want to provide a short road map of my upcoming blogs. Each of these will draw on one way in which producing my first book, The Futility of Law and Development: China and the Dangers of Exporting American Law, intersected with my background as a comparativist and as an anthropologist. In the course of producing a first book that was only inspired by my doctoral dissertation, I routinely had difficulty describing exactly what my book “is” in a disciplinary sense. I have at times said it is comparative, international or transnational legal history; and all these labels are to some degree true. It is a book that primarily involves events in a foreign setting, China, but is most directly, from my view, a work of American legal history. Furthermore, answering the question at the heart of the book led me to engage with legal history, but also religious and diplomatic history. And throughout these encounters my training as an anthropologist influenced how I read, interpreted, and synthesized the sources I drew on from disparate archives and literatures. All of which was deeply impacted by my own autobiographical migrations, both in a disciplinary and a geographic sense. In these posts I will advance a variety of claims related to how I came to think about my own method and perspective as a scholar. But I should say that comments and criticisms are more than welcome. I believe myself lucky to have been brought into legal history during a time when so much productive novelty and ingenuity is opening and re-opening exciting avenues of research. But coming to grips with how to do well what is novel is recurrent scholarly challenge, and I am still far from having worked it all out myself! With England’s Great Transformation, Marc W. Steinberg throws a wrench into our understanding of the English Industrial Revolution, largely revising the thesis at heart of Karl Polanyi’s landmark The Great Transformation. The conventional wisdom has been that in the nineteenth century, England quickly moved toward a modern labor market where workers were free to shift from employer to employer in response to market signals. 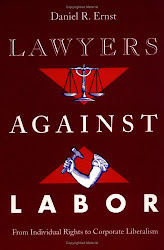 Expanding on recent historical research, Steinberg finds to the contrary that labor contracts, centered on insidious master-servant laws, allowed employers and legal institutions to work in tandem to keep employees in line. Building his argument on three case studies—the Hanley pottery industry, Hull fisheries, and Redditch needlemakers—Steinberg employs both local and national analyses to emphasize the ways in which these master-servant laws allowed employers to use the criminal prosecutions of workers to maintain control of their labor force. 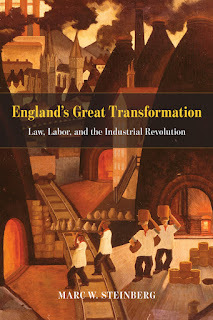 Steinberg provides a fresh perspective on the dynamics of labor control and class power, integrating the complex pathways of Marxism, historical institutionalism, and feminism, and giving readers a subtle yet revelatory new understanding of workplace control and power during England’s Industrial Revolution. More information is available here. 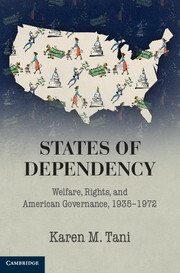 And for even more, check out this interview with Professor Steinberg on the New Books Network. What counts as law? What sources qualify as legitimate inputs to legal argument and legal decision-making? In this article, written as an invited contribution to the Harvard Law Review’s symposium issue commemorating the Harvard law School’s 200th anniversary, I use these questions to track one central strand of 200 years of jurisprudence. The analysis is episodic more than comprehensive, and the episodes are all ones with some connection, at times close and at times loose, to the Harvard Law School. But the basic theme of what counts as a valid legal source and thus of what counts as law also provides insights into two centuries of debate about the nature of law and the nature of jurisprudential inquiry. Klarman to Speak on the "Framers' Coup" at Princeton. LHB readers in the Princeton area might consider a just announced book talk, co-sponored by Princeton University’s Law and Public Affairs Program, Program in American Studies, and the James Madison Program in American Ideals and Institutions. On Tuesday, December 6, from 4:30-6:00 p.m. in 101 McCormick Hall, HLS’s Michael Klarman will discuss The Framers’ Coup: The Making of the United States Constitution. As part of the AHRC-funded project ‘Women Negotiating the Boundaries of Justice’, and in conjunction with Swansea University’s annual ‘Symposium by the Sea’, we are pleased to announce a two-day symposium on the female litigant in the medieval and early modern period (c.1100-c.1750). The intention is to bring scholars together in order to explore women’s access to legal redress and to shed new light on individuals’ lived experiences of the law. We are seeking 25-minute papers from researchers (of all career-stages) working on any aspect of the history of women litigating in the courts across the known world during this broad timeframe. We welcome work on all courts, regions, jurisdictions, ethnicities, languages and religious and confessional identities, and on any aspect of those histories or historiographies. Post-graduate students are encouraged to apply. Topics and approaches might include (1) the operation of gender in the courts; (2) the practicalities of litigation: travel, subsistence, accommodation, planning and expense; (3) the impact of a woman’s life-stage, status or ethnicity on her experience at law; (4)the woman’s voice and barriers to its ‘audibility’; (5) visual or textual representation of the female litigant; (6) specific case-studies and longue durée perspectives; and (7) historiography and ‘where do we go from here?’. Applicants are invited to submit by 21 January 2017 a proposal of c.500 words, together with a short biography for inclusion in the programme. Please send proposals to Dr Emma Cavell at e.cavell@swansea.ac.uk or to womenhistlaw@swansea.ac.uk. Queries may also be directed to Dr Emma Cavell at e.cavell@swansea.ac.uk or to womenhistlaw@swansea.ac.uk. Tweet us at @WomenHistLaw. We are pleased to announce that Jedidiah Kroncke will be joining us as a guest blogger for the next month. Professor Kroncke is on the faculty at FGV Direito SP in São Paulo, Brazil, where he teaches courses ranging from Comparative Law to Socio-Legal Studies. Prior to that position, he held a series of prestigious fellowships, including at Harvard Law School, New York University Law School, and Yale Law School. He holds a J.D. from Yale Law School and a Ph.D. in Social and Cultural Anthropology from the University of California, Berkeley. 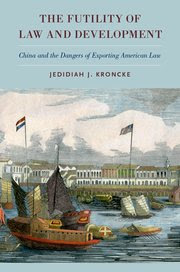 He is the author, most recently, of The Futility of Law and Development: China and the Dangers of Exporting American Law (Oxford University Press, 2016), which explores the role of U.S.-China relations in the formation of modern American legal internationalism and the decline of American legal comparativism. Other previous and forthcoming work focuses on the history of legal transplantation, comparative constitutionalism, law and development, comparative labor law, and "economic republicanism." His next book project is on the transnational history of American legal education. The NY Times Book Review covers a series of books about African Americans after the Great Migration. In addition to works of philosophy and economics, the Times includes historian Robyn C. Spencer’s “The Revolution has Come,” a “detailed organizational history" of the Black Panther party. 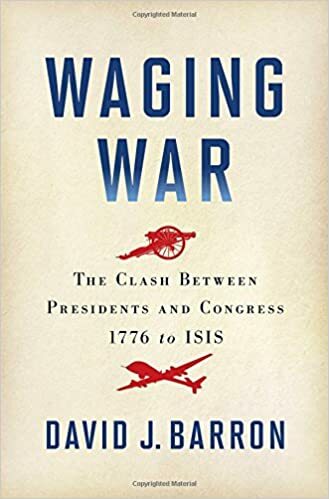 Jeremy Waldron also reviews Waging War, Judge David Barron's “fine and detailed history” of the standoff between Congress and the President over the war powers, starting from the earliest days of the Republic to the War on Terror. Barron, Waldron says, explains what is at stake for the President, but doesn’t totally investigate Congress’s motivations. Paul Finkelman reviews Barron's book in the LARB. Its not often that a Times reporter provides live coverage of a history conference, but Jennifer Schuessler of the NY Times Book Review covers a small conference conference at Princeton entitled “The Presidency of Barack Obama: A First Historical Assessment.” The historians at the conference--including Gary Gerstle, Julian Zelizer, Meg Jacobs and Jonathan Zimmerman--will publish a collection of essays on the topic next year. Why have American courts become increasingly inaccessible, even as we despair about being a “litigious society”? In the NYRB Judge Jed Rakoff reviews theories and statistics about the increasing inaccessibility of courts. In the same publication, Peter Nabokov reviews two books about Native American enslavement: The Other Slavery: The Uncovered Story of Indian Enslavement in America, by Andrés Reséndez and An American Genocide: The United States and the California Indian Catastrophe, 1846–1873 by Benjamin Madley. In the Wall St. Journal, Amity Shales reviews two new histories about Herbert Hoover and gives him some credit--or blame--for the New Deal. (However it began, the age of handouts has ended: this article is behind a paywall). In the LA Times, Mickey Edwards reviews Heather Hendershot’s “Open to Debate: How William F. Buckley Put Liberal America on the Firing Line (Warning: “Page after page is filled with those transcripts and frankly, after a bit, I found that boring; one can relive the dialogues of the past only so much.”) In the Boston Review, Robert Chase covers Heather Thompson’s Blood in the Water: The Attica Prison Uprising of 1971 and Its Legacy. James Livingston’s humorous takedown of former Economist editor Marc Levinson’s An Extraordinary Time: The End of the Postwar Boom and the Return of the Ordinary Economy in the New Republic also offers a short history of Hayek’s legacy and mid-century economic thought. On the New Books Network you can listen to Coll Thrush on his Indigenous London: Native Travelers at the Heart of Empire (which “recasts five centuries of London’s history through the lived experiences of native visitors from Canada, the United States, New Zealand, and Australia”), Matthew Pauly on Breaking the Tongue: Language, Education, and Power in Soviet Ukraine, 1923-1934 (“a detailed investigation of the language policy–officially termed Ukrainization–that was introduced in Ukraine during the formative years of the Soviet Union”); Bryan Roby on The Mizrahi Era of Rebellion: Israel’s Forgotten Civil Rights Struggle, 1948-1966, and Marc Steinberg on England’s Great Transformation: Law, Labor, and the Industrial Revolution (which is centered around three case studies of “employers using draconian master-servant laws to control the labor force”). Finally, this year’s National Book Awards engage with American history from a variety of disciplines. Awards went to Robert Caro, March, the three-volume graphic novel about John Lewis’s life and civil rights work, Colson Whitehead’s novel Underground Railroad, and Stamped From the Beginning: The Definitive History of Racist Ideas in America by historian Ibram X. Kendi. The Awards made a “powerful statement,” according to the the Atlantic’s Arnav Adhikari. Maybe, just maybe, Americans are thinking about race right now? For those interested in the upcoming "Law As . . . " Symposium that we recently mentioned (hosted at UC Berkeley this December 2-3), note that papers are now available on the symposium website. Montgomery (Indiana) Circuit Court Judge Harry A. Siamas discussed the history of his court in the Journal Review. The American Historical Association has issued a statement on the aftermath of the recent Presidential election. Here is the University of Virginia's release on Fahad Bishara, an assistant professor of history, who “specializes in the economic and legal history of the Indian Ocean and the Islamic world. His current book, ‘A Sea of Debt: Law and Economic Life in the Western Indian Ocean, 1780-1940' is a legal history of economic life in the western Indian Ocean during the 19th century." St. Mary’s University Twickenham London continues its symposia on the First Women Lawyers in Great Britain and the Empire, with "Individual Struggles of the 'Successful': Williams, Morrison, Normanton and the Rest of the 1922 Cohort," on June 29, 2017. H/t: Legal Scholarship Blog. Last Tuesday, Serena Mayeri, University of Pennsylvania, presented "'The Army’s Business is Martial, Not Maternal': Unwed Mothers, Single Parents, and the Military Welfare State," in the Law and Public Affairs Program at Princeton University. After Thanksgiving, LAPA sponsors or cosponsors "Distraction Framed: Guardianships for Mental Incapacity in Early New England," a paper by Cornelia Dayton, LAPA Fellow; University of Connecticut, on Monday, November 28, 2016, and "The Honest but Unfortunate Debtor: American Constitutional Development and Debtors' Movements to Change the Law," by Emily Zackin, Johns Hopkins University. On Monday, Nathan D.B. Connolly, Johns Hopkins University, presented A World More Concrete: Real Estate and the Making of Jim Crow South Florida, in the History at the Intersections series of Georgetown Institute for Global History. Annette Gordon-Reed on Most Blessed of the Patriarchs: Thomas Jefferson and the Empire of Imagination, as recorded on Utah Access. Via The Junto, Nora Slonimsky (Graduate Center of the City University of New York) on why steamboats deserve a place in your US history class: "they illustrate the intersecting stories of the porous boundaries between art and science, competing understandings of intellectual property, and its relationship with centralized governance in the early national period." Over at the World Legal History Blog, Iza Hussin (Cambridge University) shares this post drawing from her new book, The Politics of Islamic Law: Local Elites, Colonial Authority, and the Making of the Muslim State (University of Chicago Press, 2016). Update: On November 16, Suzie Chiodo successfully defended her LLM thesis at Osgoode Hall Law School, entitled "Class Roots: The Genesis of the Ontario Class Proceedings Act, 1966-1993." Her thesis supervisor was Philip Girard. H/t: Canadian Legal History Blog. A Hairy Hand and Other Curios from HLS Special Collections. The Harvard Law School Library’s Historical & Special Collections is pleased to announce the opening of its newest exhibit, Deep Cuts: The B-Side of Historical & Special Collections. The exhibit steps away from the collection’s “A-side,” the rare books and early manuscripts that people expect to find here, and instead focuses on lesser-known parts of the collection that include some bizarre finds and hidden gems. The exhibit includes a sculptograph of Justice Benjamin N. Cardozo ; an unappealing model of a hairy hand inspired by Hawkins v. McGee; and a rare 1957 vinyl record, James Garrett Wallace Sings of the Law and Lawyers. We invite you to view a selection of exhibit images online [here]. While there, listen to Wallace’s recording and view a 1979 U-matic videocassette entitled Langdell Legends, featuring numerous HLS professors, and Erwin Griswold]. Both of these were recently reformatted, and are part of a larger project we are undertaking to reformat our legacy audiovisual materials to preserve them and make them available to all. The exhibit was curated by HSC staff: Karen Beck, Jessica Farrell, Jane Kelly, Edwin Moloy, Mary Person, and Lesley Schoenfeld. It will be on view in the Caspersen Room, Harvard Law School Library 4th floor, daily 9am-5pm through March 2017. If you are in the Boston area, please stop by and have a look! Pincus, "The Heart of the Declaration"
ASLH Report: “Women, ‘Aliens,’ and Citizenship"